Every association is different. Each has different needs, ideas and goals. Whether your association has 10 members or 100,000 members, a management structure can make it or break it. Over the years, associations have grown in number and size. Managing these associations has become increasingly complex. Getting It Done is able to deal with this complexity and rapid changes taking place in professions, technology and government regulations. Many decisions, from the smallest to the most crucial, have to be made in your association. Utilizing our firm will allow association leaders to put more energy into their industry and profession rather than into time consuming administrative tasks. An association management company allows your organization to do this, along with helping meet its overall mission and goals. QuickBooks Online will be utilized which allows board members/committee chairs to login and the ability to run any reports desired. Security measures will be put in place to limit authority of BOD and Chairs to edit/change information. CPA will be available to attend board meetings via conference call or in person. Sheila Hamilton has over 18 years of experience and success with the research, coordination, set up and implementation of meetings and events. Getting It Done will execute flawless coordination for your events, meetings, and special projects, whether it is a Board of Directors meeting, a committee meeting, a teleconference, or an event with 2,000+ attendees. Agendas and documents will be displayed on screen during meetings by staff thus alleviating the need for costly printing and mailing of manuals or confusion during meeting. Printed documents will be available upon request. Documents will remain in the SharePoint site permanently for perusal and/or historical research. Meeting minutes and action items will be sent electronically no more than 30 days after each meeting, as well as posted to the SharePoint site. Name badge holders, inserts, ribbons, on-site badge printer and laptop will be supplied for each event and/or meeting at no additional cost. We provide the supplies as part of our management fee. the membership retention and recruitment campaign and make recommendations to better the organization working closely with the membership committee and board member liaison. 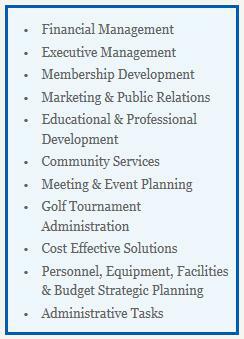 Getting It Done’s staff, will work closely with all the members in order to maintain an accurate membership directory. Review of the directory is handled on day-to-day basis and will be kept current. Members with outdated database information will be contacted by all means necessary to locate the current phone, address, email, website, etc. Shelley Lloyd, CEO, will be the point of contact for all website related services and electronic information. She comes with a wealth of knowledge and will help members evolve to today’s electronic media and information standards. In addition, Getting It Done utilizes an offsite SharePoint site to store electronic documents which are accessible 24/7 via password which can be made available to board members and committee members as needed.